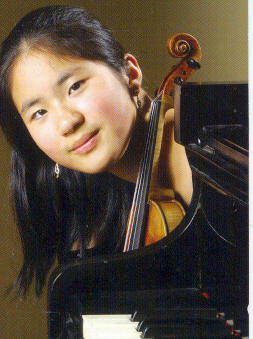 What does 15-year old Juilliard School student Anita Chen do with her spare time? In this debut recording she can be heard playing concertos on both piano and on her second study instrument, violin. The hour long programme was recorded in March 2006 and is quickly available for purchase'. Born in America to Taiwanese parents July 1991, this prodigioulsy gifted girl makes her highly unusual debut with concertante works for both piano and violin: Grieg's Piano Concerto and two rarities. The Jules Conus violin concerto (c.1898) used to be featured by both Kreisler and Heifetz, but I found it rather formulaic in content though structurally interesting in its continuous 19 minutes span with an embedded slow section. The violin is a little too closely miked and the orchestral tone sometimes a bit rough. She encores with two pieces by her teacher, violinist Albert Markov;Taiwanese Improvisation showcases her doubble stopping, and Formosa Capriccio starts schmaltzily, but grows to a zestful conclusion. Grieg's piano concerto is impressive and far beyond mere routine. Balance is better, and there is good rapport with the conductor. Musical Pointers rarely indulges in comparative reviewing, and never of canonical warhorses, but I could not resist playing Chen's Grieg in parallel with a newly received account of the Grieg by Artur Rubinstein (1887-1982) on DVD, videoed in 1975 at Fairfield Hall, Croydon, and released as Rubinstein at 90 with a typically fluent talk - scarcely an interview! - at his home in Paris, shortly after failing eyesight had led to his retiring. No question what he did in his spare time; not practice too much, he tells us; an omniverous devouring of life and the arts in all their manifestations, and a philosophical attitude towards death that couldn't be far ahead. 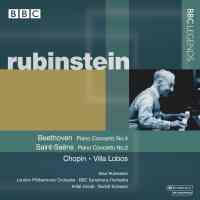 Rubinstein's traversal of the Grieg is at times a little slower than Chen's; ponderous or magisterial, as you choose. Both priced reasonably; I think you should inspire yourself with both the young and the very old!